In Ethrea, Rhian sits upon a precarious throne. Defiant dukes who won't accept her rule threaten the stability of her kingdom. Dexterity has been banished from her court in disgrace. The blue-haired slave Zandakar, the man she thought was her friend, has been revealed as the son of a woman sworn to destroy her world. And Rhian's husband, King Alasdair, is unsure of her love. The trading nations refuse to believe Mijak is a threat, and promise reprisals if she dares protect her realm. Only Emperor Han of mysterious Tzhung-tzhungchai knows that the danger from Mijak is real. THE HAMMER OF GOD is the stunning finale in the Godspeaker trilogy, the new fantasy blockbuster from an author who is taking the fantasy world by storm. 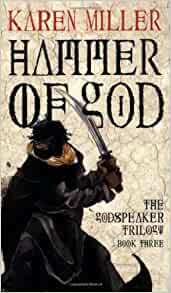 Start reading Hammer of God: Godspeaker: Book Three on your Kindle in under a minute. Karen Miller was born in <?xml:namespace prefix = u1 />Vancouver, Canada, and moved to Australia when she was two. Over the years she has held down a wide variety of jobs, including horse stud groom in Buckingham, England. 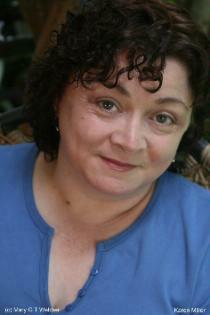 Find out more about Karen Miller at www.karenmiller.net. I gave a valiant effort in that I actually finished the first 2 books in the series. But, alas, this book just completely lost me. The originality of the first 2 books went out the window with the setting and troubles of this struggling heir to a throne camped by malicious noblemen and clergy, and the issue with female sole ruler etc. It just got boring. It is, I suppose, a daring prospect for any author to so completely turn the aspect of a trilogy, not only as protagonists goes, but geographically as well, and I felt like I was reading a book which should have been the first, in its own trilogy, or series tbh. - I would give the first 2 books a positive go ahead, but this one, tbh, lost me quite early on. The clear impression is that the author had lost interest and just went through the motions. The reader, at least, is free to stop before the end or at least to skip all the padding. Excellent. The finale of a great trilogy. A fast pace, easy to read novel, great characters and well crafted fantasy world. I like the first book of the series but this book is much better than it's first part Empress. The story really unfolds and keeps you interested and wanting more. The first part was very bloody, but if you were put of by that, this part is not. Generally, I think it's a great book, (if you are into that type of sci-fi) and I'm on my third book of this series. Good read with interesting story, well build characters and penmanship which is enjoyable to read. Thoroughly enjoyed this book I found it kept me wondering what next would happen. Kept me interested all the way through the book.